The climbing rose Colonial White in full bloom along a porch roof. Deadheading should be the simple process of removing old blooms from your roses to encourage new ones. Yet, even this has become far more complicated than it should. You’ve likely read the rules. Deadhead down to a five leaflet leaf set, on an outward facing bud eye, with a 45 degree cut, 1/4″ above the bud eye; the list goes on. In reality it’s much simpler for Garden Roses. For Garden Roses simply deadhead down to the first set of healthy leaves. The reason? Healthy leaves mean healthy new growth. 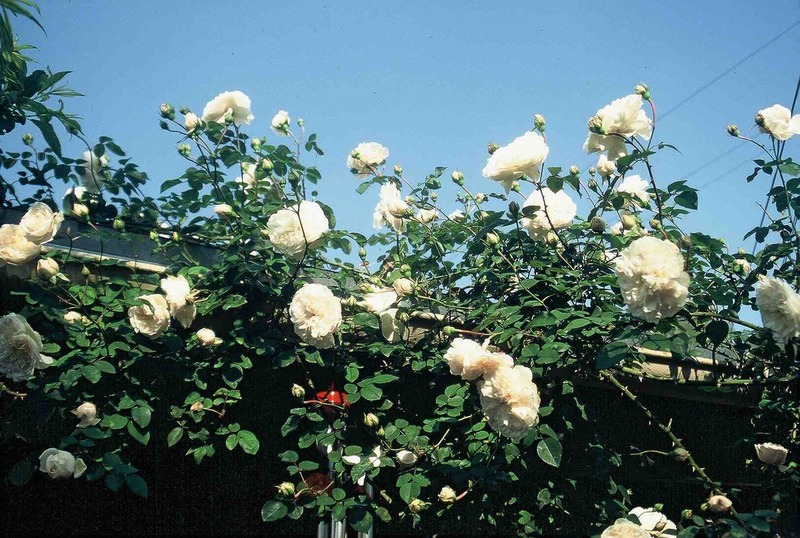 We don’t worry too much about the eye being outward facing or not, because with Garden Roses you want flowers all over the bush. So just snip above healthy growth and use your instincts to keep the bush shaped nicely. A little word on why deadheading works. A rose’s instinct (like any plant) is to reproduce. In the case of rose via seeds. Rose seeds are contained in their hips, which are the “berries” you see produced at the end of the stems after the flowers have fallen off. By cutting off the old blooms you are preventing the rose from setting seeds to reproduce, so by instinct it makes another flower. Because roses keep producing flowers when you cut off old blooms it’s important to stop deadheading with the onset of cold weather. We want the roses to go to bed. And the only way to do that is to let them “set seed” in the form of hips. At that point instinct tells them their job is done for the season and they go to sleep for the winter. While deadheading during the season you can also “trim” the the rose bush to keep it under control. While deadheading, simply cut down to the size you want the bush to be without taking off more than 1/3 of the growth. We do it all the time and keeps the garden tidy. Go down the stem until you find a healthy set of leaves and make your cut above that. New growth will grow in the direction of the bud-eye so you can use that to control the shape of the bush if you want. Or you can simply not worry about it. Stop deadheading with the onset of cold weather so the rose can go to sleep. During the season use deadheading as a chance to shape the bush.